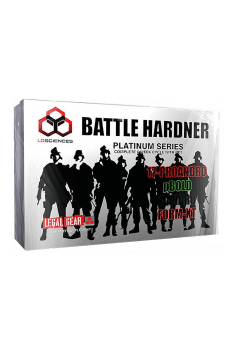 LG Sciences Battle Hardener is a complete set of 3 cult preparations, consisting of anabolic Pbold, that increases the muscle hardness, and 17-Proandro and Form XT, that allow the body to return to the homeostasis state after the cycle. This supplement promotes the significant body and strength progress that persists even after the treatment. This product contains 17beta- [1-Ketoethyl] -androsta-1,4-diene-3-one, 17a-ol, called 1,4-OHP. It is a precursor to the well-known steroid – boldenone, and they both have a strong anabolic effect. In addition, it increases appetite and generates the positive nitrogen balance in the body, causing the increase in the protein synthesis. These properties make this prohormone to be a key measure in the cycles that are aimed at building a good quality muscle mass. Its low androgenic and estrogenic activity reduces the chance of the negative side effects, such as increased water retention, gynecomastia, acne or prostatic hypertrophy. It is based on 17beta- [1-Ketoethyl] -androstane-3-one, 17a-ol, known as 5aOHP. In the human body it converts to a stanolone, called dihydrotestosterone, or DHT, which is much stronger androgen than testosterone. Prohormone has a very similar action to winstrol, a popular steroid used to "whip and sculpt" the figure. Winstrol is popular among athletes who want to achieve high muscle hardness with low fat content. Contains androst-3,5-diene-7,17-dione - arimistane, which is a very potent aromatase inhibitor and trans-resveratrol. Aromatase inhibitors reduce the activity of the aromatase enzyme, that is responsible for the excess androgens conversion into estrogens. This product is used to increase the natural production of testosterone, and to normalise the hormone metabolism after cycles on anabolic-androgenic agents. Arimistane is an ideal supplement for athletes who take anabolic drugs such as steroids and prohormones. It effectively eliminates the negative consequences connected with taking steroids, including excessive fat gain, increased water retention, gynecomastia or increased blood pressure. Arimistane has also other advantages. By increasing testosterone levels it raises the pool of luteinizing hormone (LH), and it lowers cortisol – the stress hormone. Trans-resveratrol has a strong antioxidant effect supporting the cardiovascular and the nervous systems health. This polyphenol acts also as a natural estrogen blocker that increases the testosterone availability. Apart from the ingredients mentioned above, each component of this supplement contains epicatechin with a strong anabolic properties. It has been demonstrated that through the stimulation of follistatin secretion it inhibits the release of myostatin, that limits the muscles development. Its additional advantage is the ability to eliminate the decomposition of nitric oxide (NO), that plays an important role in stimulating the division of satellite cells. It improves the post-workout regeneration and increases the muscle mass. What is more, NO affects the blood vessels relaxation, increasing the blood flow through the working muscles. It also raises the anaerobic transformation limit what allows to perform more repetitions. LG Sciences Battle Hardener is a set of preparations with a strong anabolic effect. They help to achieve the dream sports results, including the strength and the muscle mass increase, and at the same time they improve the muscles quality. The icing on the cake is enriching this supplement with the preparation that reduces the possibility of the side effects occurrence, and that allows the body to return to the state from before the cycle. Take 1 tablet of Pbold twice a day: in the afternoon and in the evening for the first 4 weeks of the cycle. Take 1 tablet of 17 Pro andro twice a day: in the morning and in the afternoon for the first 4 weeks of the cycle. Take Form XT from 4 to 6 week of cycle 3x a day: 1 tablet in the morning, 1 in the afternoon and 2 in the evening. During the cycle, sometimes the doses of the individual preparations overlap. In case of taking 2 products at the same time, a minimum 10 minutes interval between the doses is recommended. After the cycle is completed, at least 8 weeks break is recommended before starting the next cycle. LG Sciences - is an American brand of dietary and nutritional supplements for bodybuilders. Products are made based on the formulas developed by the best research laboratories, which is the best guarantee of a real improvement in the effects of the gym exercises. LG Sciences products are made from certified and tested ingredients and are formulated to achieve a variety of training purposes - from gaining the weight, by increasing the endurance and strength of the muscles, to the regeneration or building of muscle mass. The offer includes both hormonal and non-hormonal supplements. A wide selection of products allows any bodybuilder to find the right solution. The company has numerous certificates confirming high quality of products. Supplement increasing the level of testosterone. It increases levels of dopamine and GABA, speeds recovery. Supplement increasing level of natural testosterone. It increases levels of dopamine and GABA, facilitates regeneration. Dosage: the lack of strict standards of daily consumption.